Have you lately thought about termites? Probably not and yet, termites are among the highest ranking damages that houses all over the U.S. suffer every year. When you or your local termite expert have discovered the presence of termites in your business or residential structure in North Phoenix, you need a course of action that is affordable, effective and safe for you and your loved ones. By letting bugs “roam free” you are allowing the damage to your home to become bigger and more expensive. In fact, termites are one of the main causes of home damage all over the U.S.
No matter if you found the termites through one of Varsity’s thorough and free North Phoenix termite home inspection or if you discovered it on your own, now is the time to act fast, to minimize damage and to get treatment that works. We have helped countless North Phoenix residents and businesses in the treatment and control of termite populations using various methods, including the revolutionary Sentricon Termite Colony Elimination System. While a lot of things in life are suitable to DIY, pest control is not one of those times. By hiring an expert such as Varsity you significantly increase the odds completely removing and exterminating any termites. In addition, a professional termite pest control company has tools that the average person neither has nor knows how to use. Our North Phoenix exterminators work with specialty tools such as pumps, special masonry tools, and soil treatment rods. Plus, our team is able to get in areas that you just can’t. If you want your termite problem confronted head-on, you call Varsity. We can follow all the guidelines, spray when needed and give you the green light, when your home is safe again. Do I Even Have Termites? Termites are really common in North Phoenix and nearby communities, so the odds are already against you. A professional termite inspector can detect signs of pest activity long before you ever will. You can be pretty certain that termites have moved in with you, but through specialty equipment such as thermal imaging and others, a professional termite expert can detect termites before the signs of damage are obvious to the naked eye. The best way to get rid of termites is to discourage them from ever moving in. Easier said than done, but there are some things you can do to reduce the odds of a full blown infestation. Because termites like it dark and damp, your house is the perfect abode for the entire swarm, plus there is tons of food to be had since they feed day AND night without cessation on your home and all wooden items. If you suspect you have termites in your home, contact your experienced and affordable North Phoenix exterminators today. We offer top notch pest control services, fast response times and great rates as well. We treat every home as if it was our own and we are proud of the great reviews our customers give us on Yelp and Google+. 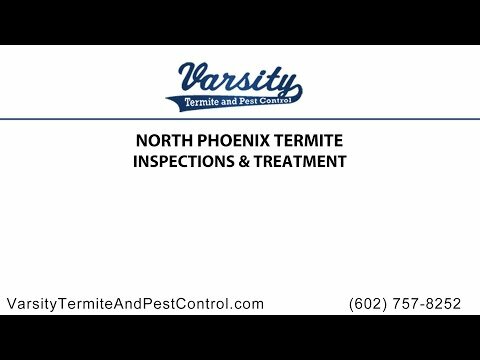 Varsity Termite and Pest Control has helped business and home owners in the North Phoenix area to stay termite free for years. In addition to termite control, we can also assist you with scorpion control and removal, pigeon control, roof rats and more. We deliver pest control solutions that work and which are safe for your entire family. Protect your home and your business with a free inspection by Varsity today – and if we detect termites, rest assured, we’ve got you covered.